Here is photo of the PM 1150. 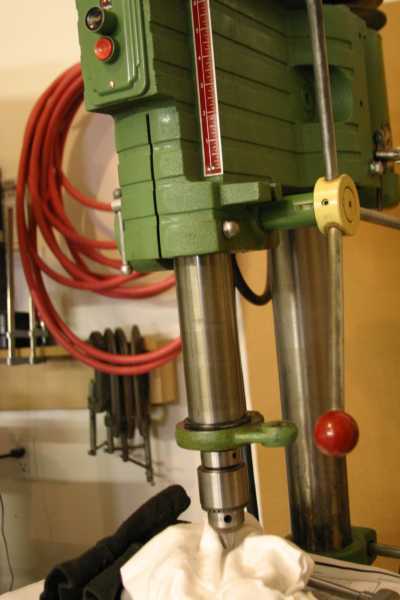 A classic 15" drill press that is durable and serviceable. 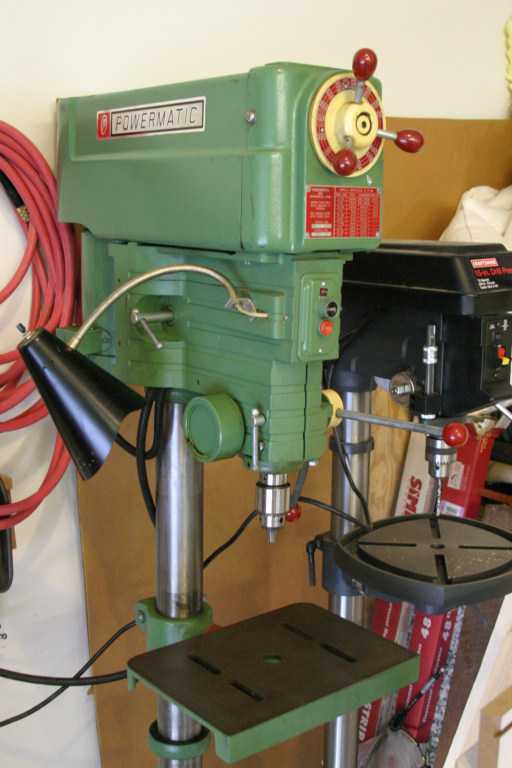 The following sequence is designed to help a new owner replace ALL bearings and thus give the drill press a "new life" for the next 20 + years, even more in a hobbyist shop-provided the motor is in good working order. This is a 1966 PM 1150. 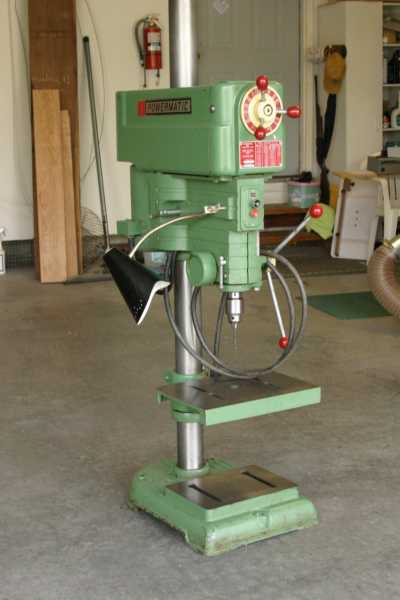 It has a Robbins & Myer 1 hp -1725rpm -1 ph motor; currently wired for 110v (a 220v wiring diagram is listed on the motor). A newer 2002 Sears 15" model is in the background for scale. This is an abbreviated guide but should get one through the basics of the machine. Cleaning and such is not mentioned much but goes with the territory. Reading through this manual at least once before you start would be a good thing. Robert Vaughan guided me through this via a few emails and phone calls. I took some photos along the way to help document the procedure. To work on the machine, I decided to lower the head and put it in "bench top mode". I ask my neighbor to come over and help as the head is probably 175 lbs and I needed an extra set of hands. The first order of business is to remove the belt cover, exposing the VS Reeves Drive. Turn on the DP and set speed almost to full (about the 4000 rpm mark) and turn off, IMPORTANT! 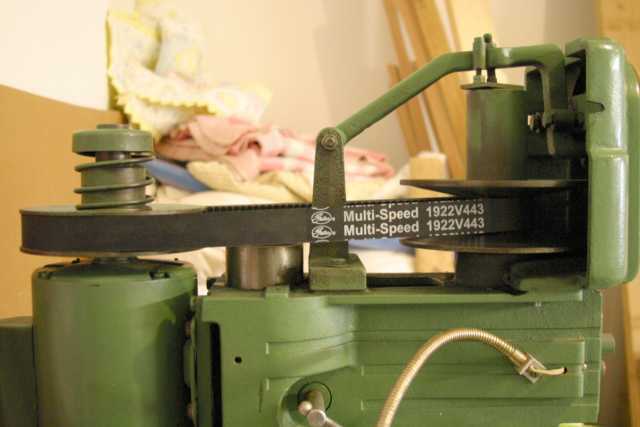 At this time, it is easy to get to the set screw of the rear pulley because the belt has the shaft spread apart. 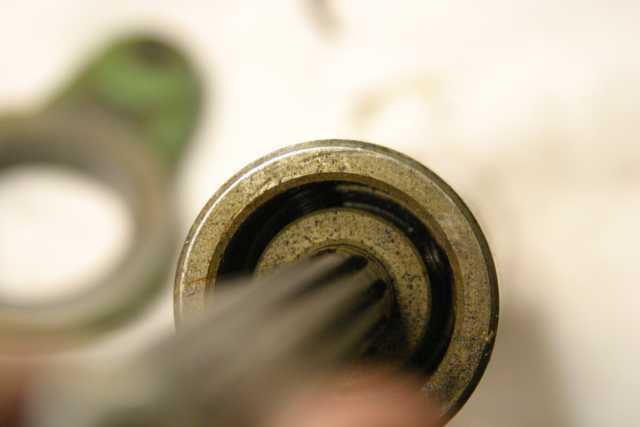 Use a 5/32" allen key wrench to loosen the set screw. Now you will be able to pull the entire motor pulley assembly up once the belt is off. This will be done at the end of this tutorial. Turn the speed dial in front counter clockwise (faster speed) just a bit to the full 4800 rpm mark, you will notice the belt will have more "slack" in it now. With this newfound slack, use your hands to manually turn the belt and rear pulley clockwise, lifting the belt up and off while turning. It will ride up the edge and slip off. Watch those fingers! 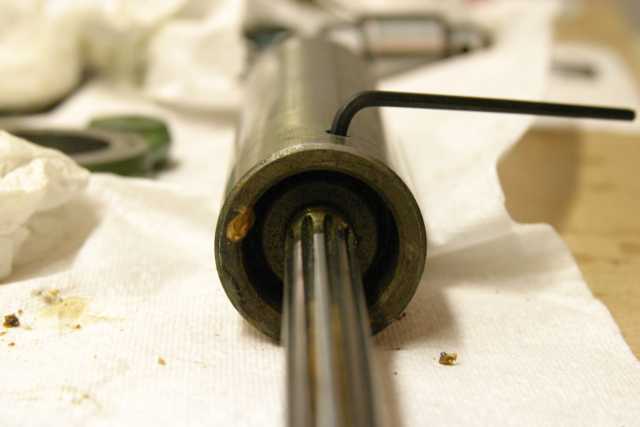 The spring loaded pulley will release once the belt if off and pop down hard – be careful! 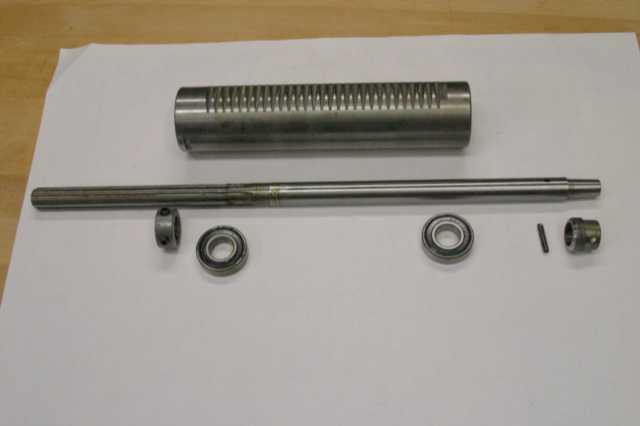 Loosen the end of the bar (located in the middle of the assembly) and take the bolt out. 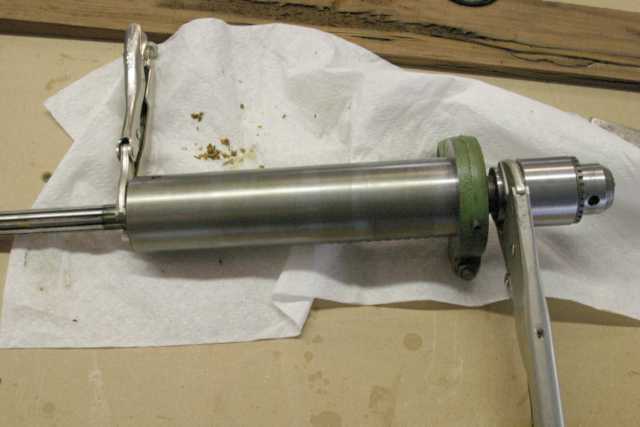 Remove one of the retaining bolts that keep the speed bar in line and slip the bar out. Remove the front CI head (containing the speed dial) by removing bolt on each side of the front casting. 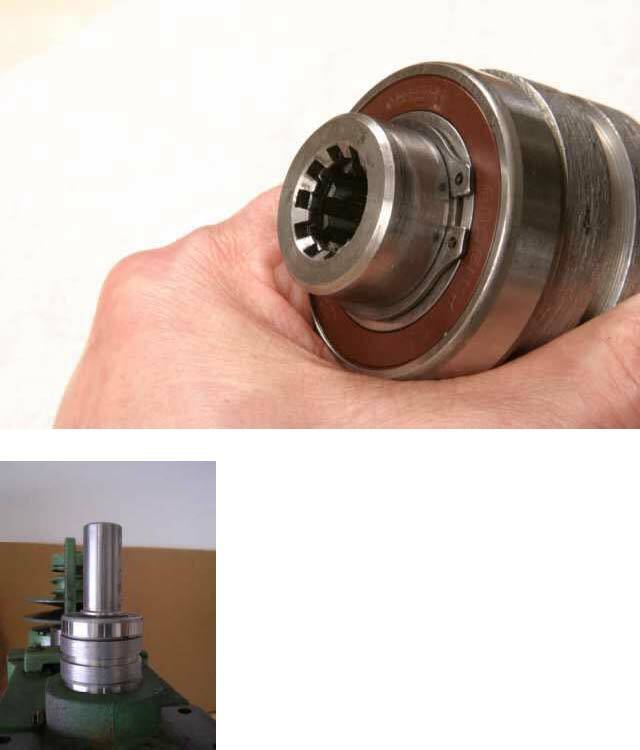 This leaves you with the upper spline drive casing. It has two bearings and a spacer that will need to be pushed out from below. We’ll get to that in a bit. Next, remove the quill. 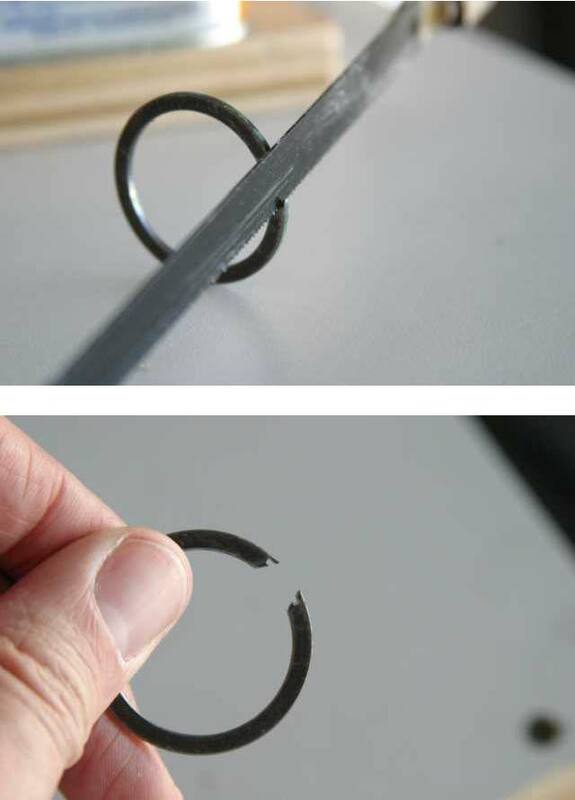 Hold the return spring casing in your left hand. 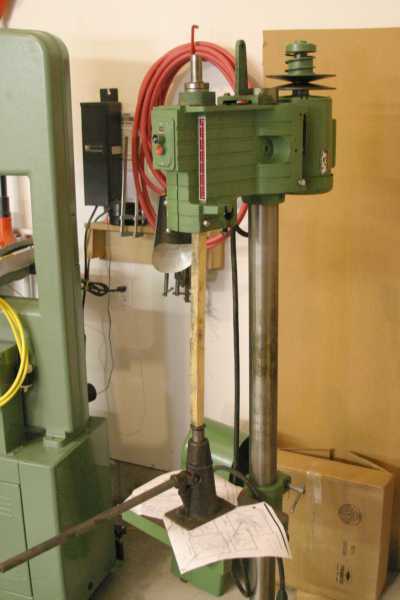 Loosen the left bolt under the main head casting and the spring will begin to unwind counterclockwise. Hold on the spring casing!! Let it slowly unwind. Lower the quill and tighten the quill stop bolt. 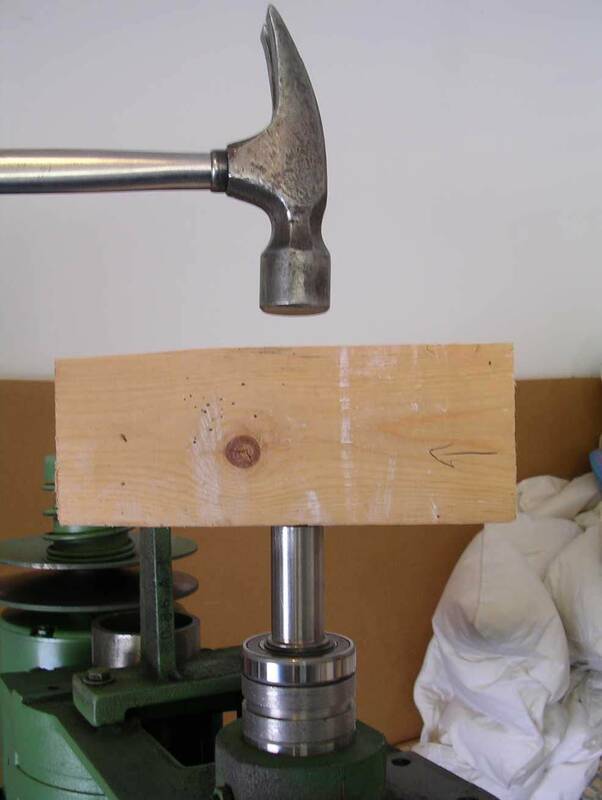 Remove the depth stop rod. 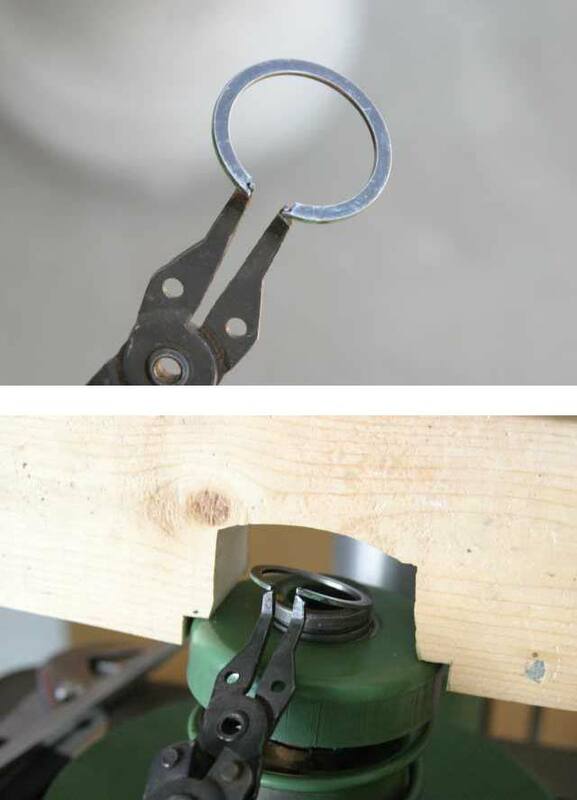 Remove the snap ring on the spring casing and take the cover off. 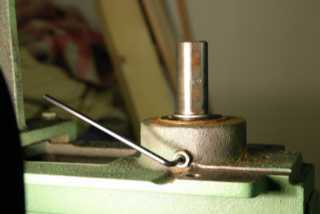 Slowly pull the spring assembly off the quill pinion rod that gears the quill up and down. 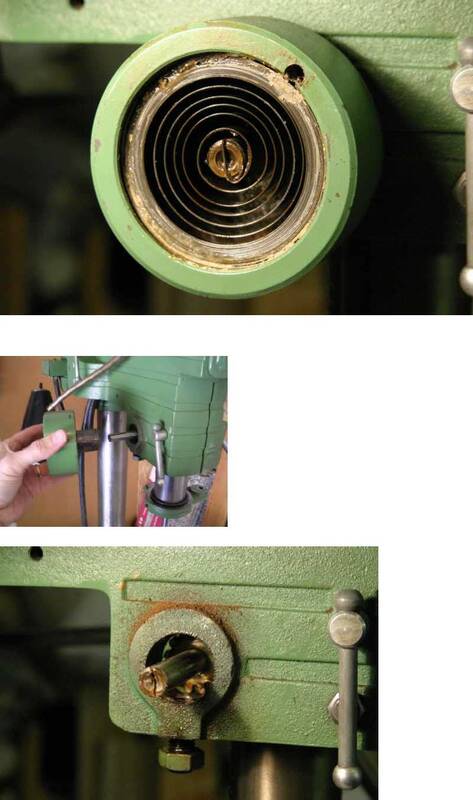 Loosen the right bolt under the head casting. This will enable you to remove the quill pinion gearing.. Be careful and DO NOT LET THE QUILL FALL! (It shouldn't because the quill stop bolt is tightened. Have the quill supported with your left hand while you pull the pinion gear out. 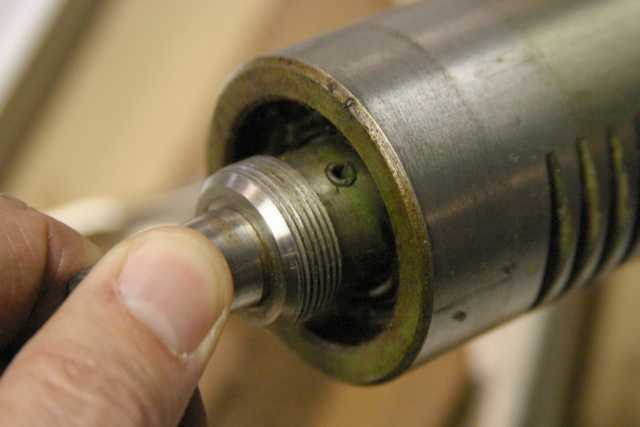 Loosen the quill stop bolt and remove quill / spindle. In my case, the old lubriplate was crusted and caked enough that the quill did not fall, it took a little more pulling and twisting persuasion to get it off. See the lower bolt in the photo above, this is the one you loosen while gripping the spring casing and letting it unwind slowly. 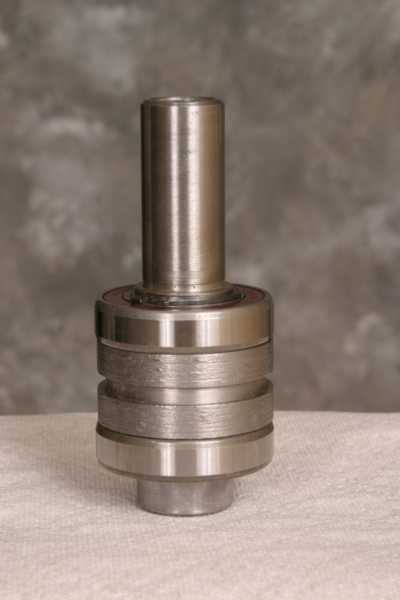 There is built up Lubriplate on the Pinion Gear in the photo below. Standard wheel bearing grease was my replacement after cleaning. Now the quill pinion assembly is pulled out and I'll remove the Chuck and quill stop. 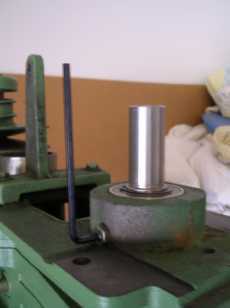 To press out the bearings in the Quill / Spindle assembly. Loosen TWO set screws on the upper quill. They are at 90* to each other. I took mine to a local motor shop and they pressed them out. Reinstall the quill assembly. It is basically the reverse of removal. 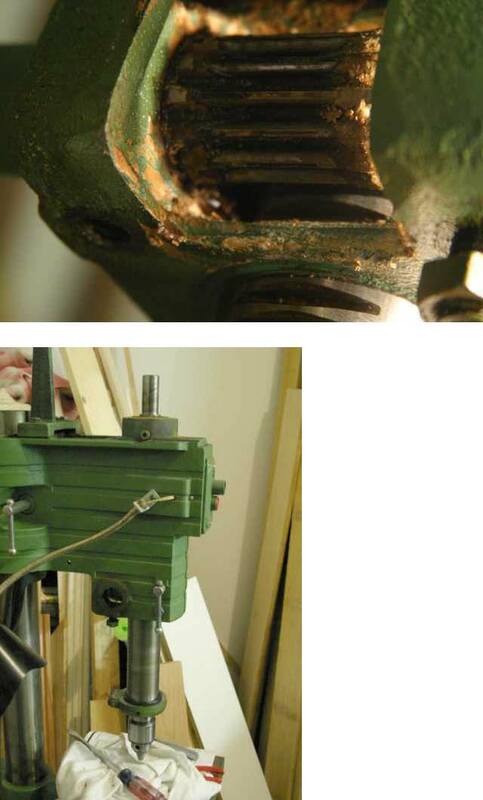 I used wheel bearing grease on the spline drive and quill pinion gears, Mobil One 5-30w oil here and there where logical. 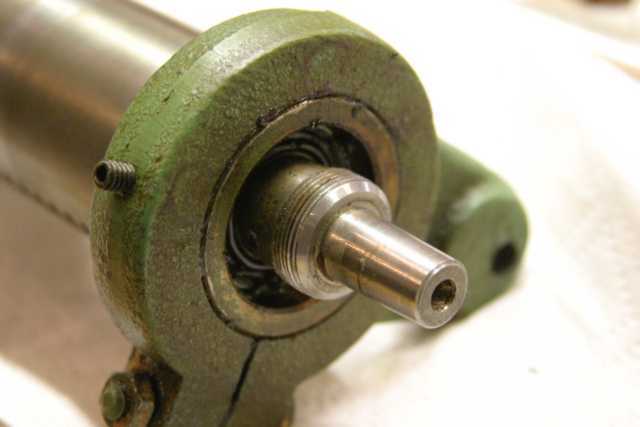 The rear motor pulley should pull off once the set screw is loosened. The spring keeps a substantial force downward to hold the belt in its proper position while operating. Be very careful in taking this off. Clean and re-lube as needed. 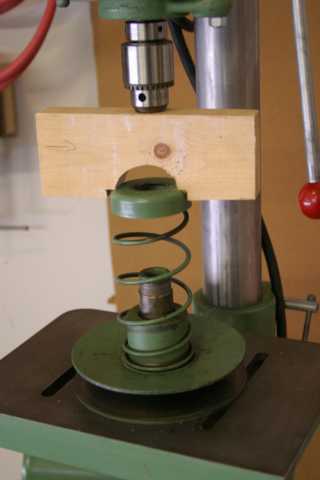 For re-install, depress the spring using the yoke and drill press to compress - then lock the quill. I had a difficult time putting the snap ring back on. I decided to cut some grooves in the ring to get a better hold and it proved successful. See photo sequence. I wedged the belt back between the flanges so I could see the set screw. 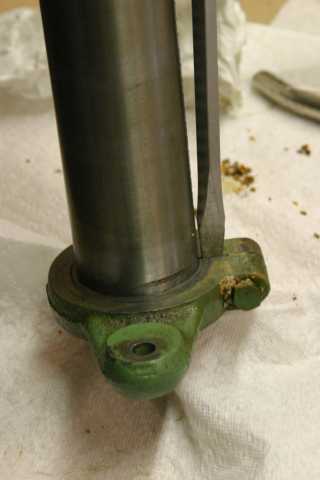 Reinstalled on the motor shaft and then tightened. Reassemble the remaining pulley, CI Head, and VS drive. 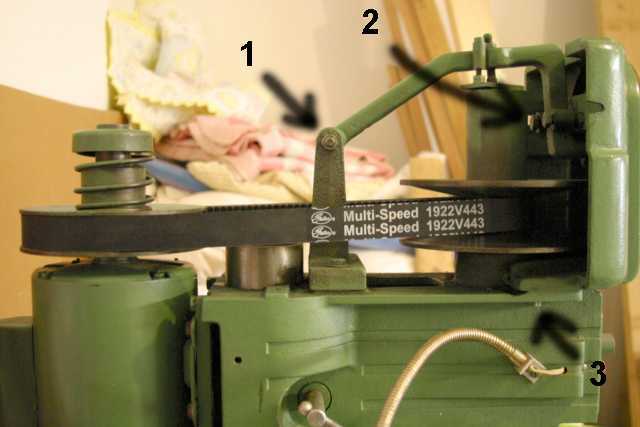 Make sure if the speed of the head is still at 4800 rpm, you "hand rotate" the belt back to that original position (belt on OUTER edge of rear motor pulley, INNER edge of front pulley) and then start up the machine. 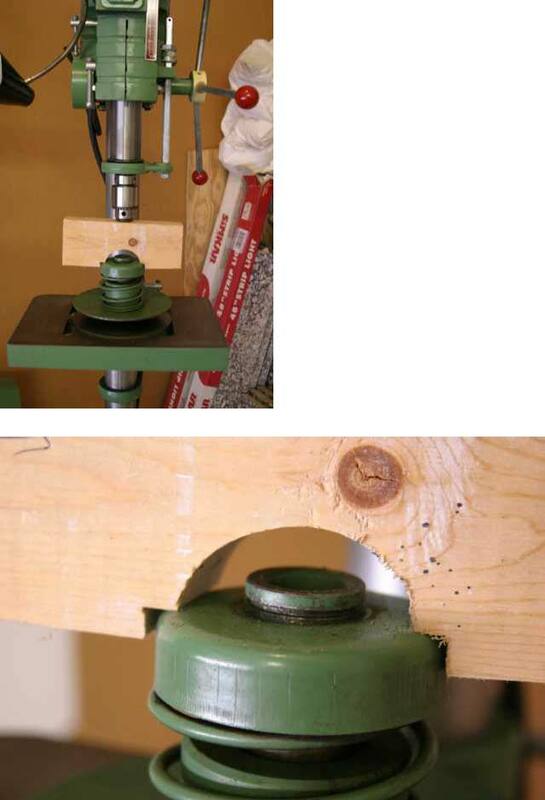 Obviously, there are many ways to do things, but this should give out enough information to show the "nuts and bolts" of how to go about any drill press bearing replacement. Again, thanks to Bob Vaughan for the invaluable assistance. 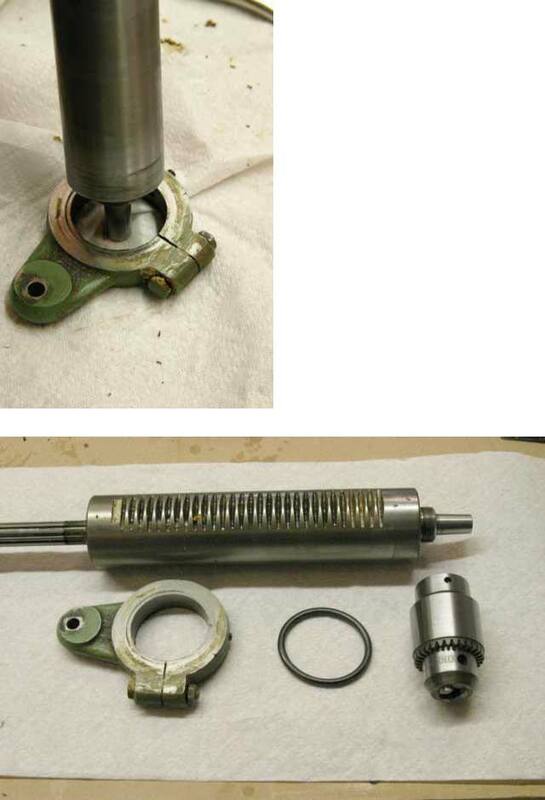 All of this information was obtained from Bob -an expert in machine restoration and super Good Guy. This was a great learning experience and it was fun to document with a camera. Enjoy your machine and be safe!